Man oh man, we have a long, hard road ahead! If you can believe it, this has been the roughest weekend we’ve had with Brax since we brought him home from NICU. He’s never been one to fuss too much, but he was not a happy camper this weekend. Poor baby was doing so well trying to crawl and now he’s not allowed to bear weight on his hands at all!! It’s been pretty tough trying to keep him off of his hands. Every time we lay him down he flips almost right away, he’s up on his hands and smiling as big as ever! So, obviously it doesn’t hurt it too much, but the doctor said too much weight bearing and it could damage the surgery site and skin graft site, sooo better safe than sorry and we’ll be keeping him off his hands. We’ve been trying all weekend to find things he can do without his hands. We’ve sat him up quite a bit and read him some stories, he’s got a penguin punching bag type toy and he seems to enjoy that, and we’ve also let him do LOTS of jumping in his bouncer. He LOVES that thing! He’d bounce in it all day if we let him (but he falls asleep in it, so we take him out). He’s also been sleeping much more than usual. Probably because he’s so bored from being kept off his hands. But he seems a little restless too. It’s tough getting him to sleep at night, it’s like he just can’t get comfortable and just kicks and kicks until he falls asleep. The hospital sent us home with a pain med prescription, but I hate giving him such strong medicine if he doesn’t need it, buuutt he doesn’t complain enough for me to know when he needs it! Gahhhh, talk about frustrating. I mean, I know if *I* had surgery I’d probably need it so it seems mean to keep him from it, especially since he’s not old enough to tell me what’s wrong. Guess that’s really been the struggle this weekend. Knowing when to give him the pain med versus just regular Tylenol or Ibuprofen. And of course keeping him off his hands, which he is just dying to do. Seriously can’t even leave the room if he’s awake because by the time we come back there he is on his tummy up on his hands. Silly boy. I think, overall, it’s been a pretty good weekend. Taxing on us mentally and emotionally, but we’ve had some good times too. 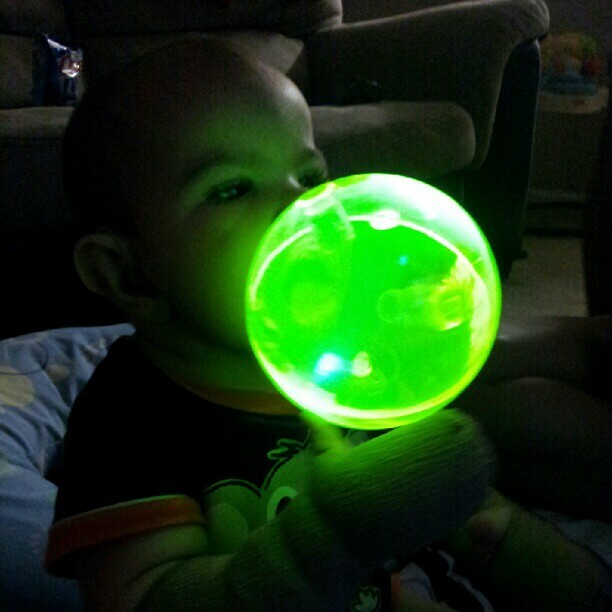 Brax still seems to be in such good spirits and manages to laugh and play with us an awful lot. Just hurts to see him trying so hard to want to crawl, to grab his pacifier, to reach out for toys and just not be able to with the bandages on. 12 more days of this. Yikes! 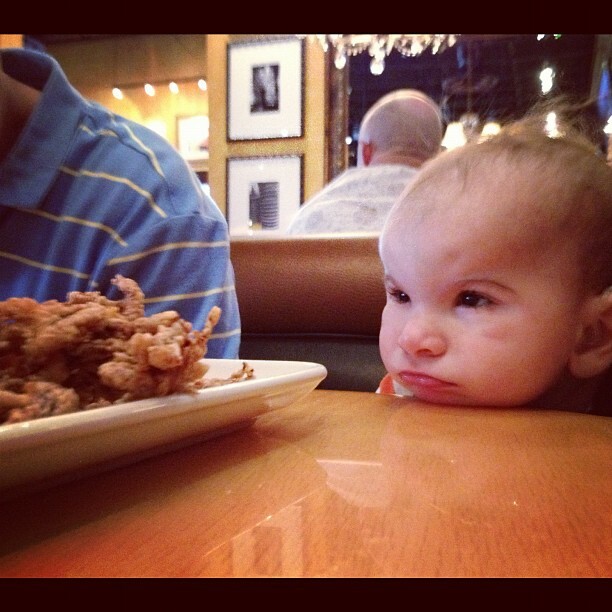 We went out to eat this weekend and Brax just stared at the food. Think he was bummed he couldn’t reach out with his hands for it. Too cute though! 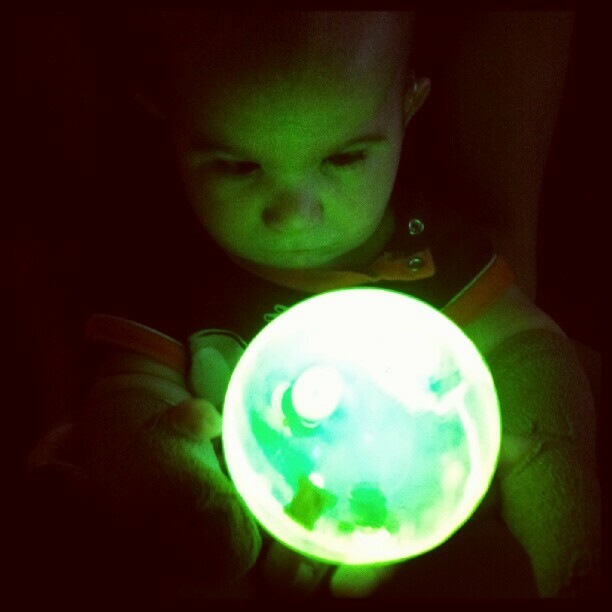 Let me take a look into my magic ball!